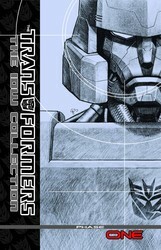 It's IDW's TRANSFORMERS, remixed. For the first time ever, the entire IDW TRANSFORMERS UNIVERSE is presented in hardcover, in chronological order! Start at the very beginning and experience each story as its events transpire in the main storyline. Featuring series cover design by E.J. Su, this run is sure to redefine your experience with the Robots in Disguise. Volume 1 contains: MEGATRON ORIGIN #1-4, SPOTLIGHT: BLURR, SPOTLIGHT: CLIFFJUMPER, SPOTLIGHT: SHOCKWAVE, SPOTLIGHT: NIGHTBEAT, SPOTLIGHT: HOTROD, INFILTRATION #0-6.